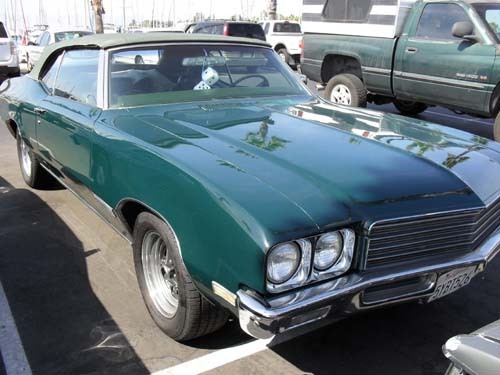 I drove a Buick Skylark as a kid and loved it. Though green wasn’t my favorite color, the car offered a little macho and some pep. My friend’s dad owned the Buick dealership from whence it came and when he grew up he, too, owned a Buick Dealership. I went to work at McCann-Erickson in the 90s and we had the Buick account. Market research began to slip out that Buick had become the brand of Q-Tips — little white heads that stuck up from behind the steering wheel. That was the 90s. As much as the client and agency derided the target and tried to go younger, they never really changed the car models. The decade of the 2000s rolled in and again management talked about aiming younger. Tiger Woods was the spokesperson – young phenom that he was. Some youthful accoutrements were put on the cars, some grilles were youthenized, a new younger nameplate introduced (Lucerne, hee hee), yet the old people car tag did not abate. Fast forward to today – the 2000 teens. “People still equate us with big, floaty, boxy cars that are driven by people in their 70s and 80s,” said Craig Bierley, director of advertising and sales of Buick/GMC in today’s paper. He added “This is really about position Buick in a progressive marketing space, so that people can think of Buick as a progressive company overall.” This quote, a reference to a new selling application for iPhones and Androids. Hello? You can market younger but the car designs must appeal so. They don’t yet. See you in 2020. Peace! Previous articleFacebook Email. The chatter and cheddar. Next articleFacial Recognition is Buggin’. Coming soon. Mass Communications Atomize.